The Environment and Water Resources Minister Vivian Balakrishnan announced yesterday that the figures on recorded mosquito breeding spots in the country has decreased since the launched of their “Do the Mozzie Wipeout” drive last April 28. 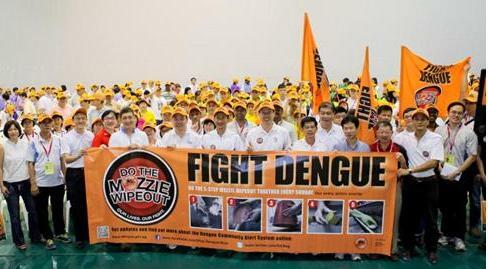 National Environment Agency (NEA) started the “Do the Mozzie Wipeout” campaign to raise awareness, to provide preventions, and to boost support from media and other relevant outfits on the status of dengue in the country. According to Balakrishnan, they recorded about 1,200 mosquito-breeding sites found in households last April. It was trimmed down to 700 spots last June because of the continuous implication of the campaign. NEA’s movement primarily aims to eradicate mosquitoes, their hatchlings and their breeding places, as well as to alert every community on dengue incidents through its Dengue Community Alert System that identifies areas which have reported dengue cases. They NEA also initiated the “5-Step Mozzie Wipeout,” which advocates dengue prevention in every home, school, and workplace. This involves a 2-minute routine done once in a week to prevent mosquitoes from propagating in stagnant water containers and roof gutters. Balakrishnan said that the number of mosquito-related illnesses declined to 264 reported cases last week, summing up the report of Ministry of Heath to 14,224 dengue cases to this year. He added that an improved community relations and awareness would lessen the number of mosquito-breeding habitats in the locale. NEA has deployed 2,000 volunteers reminding citizens to refrain from storing stagnant waters in containers, as well as to maintain cleanliness in their communities. They also distribute insect repellents in schools and households on identified dengue prone areas. Balakrishnan then advised everyone to have their own protection against mosquito-related diseases amidst of the efforts provided by the government.